Home Guest Post How To Check College Notes For Grammar Errors? 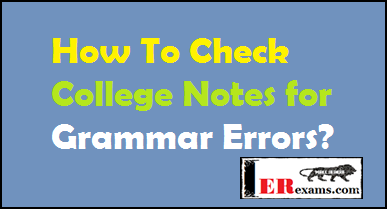 How To Check College Notes For Grammar Errors? There are numbers of problems and mistakes faced by us in English grammar and language. Mistakes in your content can make you look careless and clueless in your profession. There are various applications that are helpful in making us finding our mistakes. So before sending the content for any professional checking, correct them and proofread them twice. This will help in building a good rapport in front of your manager. With the help of these tools, your materials, business communications will be more professional and will help in scoring good grades in your college. The grammar lookup online tool helps in correcting the grammatical errors in our notes. This tool helps in correcting the mistakes and grammatical errors in your notes. You are just required to simply copy and paste the content into the space provided. The software automatically detects all the errors and highlights them in red color. You are just required to click on the red colored words and correct them with the alternatives of them. Another grammar and spelling correction tool is an online correction. It also helps in correcting the grammatical and spelling errors in your college notes. This tool is quite simple and helps in correcting the content just by pasting the content in the text box area. The spelling errors will be highlighted with red marks whereas grammar errors are highlighted with green marks. Although this might sound crazy, Google docs help in building a grip on grammar and makes your content solid. The Google docs not only check the spelling errors but are a powerful engine in detecting the grammar errors and save our lots of work and time. With Google docs, you can simply write your content in it and can simultaneously correct the underlined word with the suggestions and replacements. This is another grammar checking and manuscript editing software which can be extremely helpful for college students to correct their notes. The main advantage of prowriting aid is that it helps in making you’re writing a great writing instead of just good scripts. Many publishers and authors use ProWriting Aid as their tool to improve their writings before publishing their content. This helps and makes the students convenient to check their contents online. The college student jobs online working as freelance or part-time writers can easily correct their contents with any of the grammar checker tools and make their writing a far better context. This is another power-packed tool for spelling and grammar checking. This tool is quite robust online grammar checker tool and checks even for minor grammar and punctuation errors in your contents. With this tool, you are needed to write all the contents in the given box and then press on the check writing button. The document will be automatically diagnosed with the errors and will make you correct all the errors in spelling, punctuation, and grammar. These were some amazing and extravagant tools that will help the college students to check their notes for grammar errors and correct them easily and conveniently.